During the 1980s, the NFL entered a great era of pocket passing quarterbacks, led by quarterbacks like Dan Marino and Joe Montana, including holdovers such as Dan Fouts. 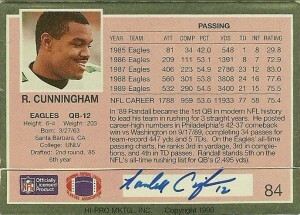 Among the lesser known names to come out of the 1985 draft, was a quarterback from the UNLV Rebels- Randall Cunningham. A raw talent with fleet legs, Randall would be taken in the second round of the draft by the Philadelphia Eagles. He was considered exciting, but a project to mold. 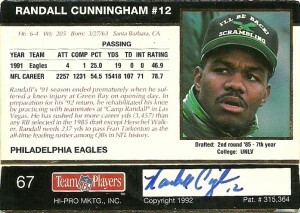 After a very quiet rookie season and a subpar Sophomore campaign, Cunningham would be handed the keys to the Eagles franchise and become their full-time starter, taking over for pocket passer and now ESPN commentator Ron Jaworski. As a playmaker, Cunningham electrified the league, with his fearless abandon to scramble and improvise on the run. He became the cover boy for Sports Illustrated, and was heroically photogenic, especially on trading cards. Randall’s name continued to grow- and he was viewed more and more in the vein of the Michael Jordan of football, who could virtually do anything he willed his mind to. Cunningham was also noted as leading the league with regularity on sacks taken. As a gambler, he would slip out of the arms of a would be tackler to frequently buy more time to put the ball downfield or pump fake and scramble. He’d absorb an NFL record at the time- 72 sacks in 1986, and lead the league also in sacks taken in 87, 88, 90, and 1992. During his time with the Eagles, he’d also set a team mark with a 95 yard bomb to Fred Barnett, and as the team’s backup punter, he’d rock a 91 yard punt in 1989 and an 80 yarder in 1994. Cunningham would be named to the ProBowl from 1988-1990 and lead the NFL with regularity in quarterback rushing yards- setting the league mark with 942 yards on 118 carries for an 8.0 average in 1990. 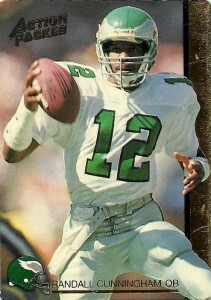 A critical injury in the first game of 1991 would end Randall’s scrambling days, as upon his return in 1992 he clearly had lost a step. He’d play for the team through 1995, when he was unceremoniously benched after the team converted to a West Coast Offense. Randall has remarked that he lost the love to play football and retired after the season. Thus would end the first chapter of Cunningham’s career as a scrambling quarterback. In 1997, Coach Denny Green of the Minnesota Vikings was looking for a backup to then incumbent quarterback Brad Johnson, who had replaced Warren Moon as their starting quarterback. Green lured Randall out of retirement and on to the roster of the Vikings to back up Johnson in ’97 where he played sparingly that season. 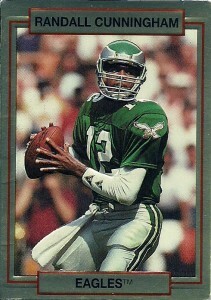 It’d be in 1998 we’d see the maturation of a new Randall Cunningham, -the pocket passer. Randall went out and set career highs, going 13-1, throwing 34 touchdowns to only 10 picks, and 3704 yards. While the team was bounced in the playoffs by the Falcons during the championship game, things were looking up for Cunningham, but after a 2-4 start in 1999, he’d be benched in favor of Jeff George. Randall would sign with the Dallas Cowboys and play there for a season in 2000, and then retire after the 2001 season with the Baltimore Ravens. In the early 90s, I was visiting family up in the Northeast, and as part of the visit, I was allowed to go to one place I had wanted to go. Since my family was unable to go to the NFL HoF, I opted to stop off at the Eagles training camp in West Chester to see if I could get some autographs. With surprisingly good timing and placement in the crowd, I was able to get guys like Fred Barnett and Herschel Walker,- but the true prize was Cunningham. My brother and I waited patiently for Randall, but he started in the line further down from me. My brother quickly got an autograph from him, and shoved mine back in. As Cunningham continued to sign, it appeared that I would be next. As he grabbed my card, I breathed a sigh of relief. He then took one look at my brother and said, “I already signed one for you,” dropped the card and the sharpie on the ground and walked away, refusing to address me. 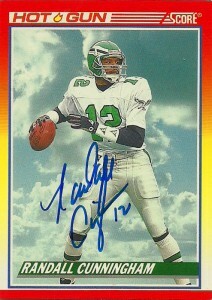 Time heals all wounds, but it was a highly disappointing experience for me in my time as an autograph collector. Randall has become a Pastor since leaving football and has returned to Las Vegas to preach. I was able to get his autograph on these cards by donating to his congregation, Remnant Ministries. Ironically the Action Packed Rookies 1990 card that I had hoped to get signed was among the cards that he autographed for me through the mail.